The outer cover is engraved and punched with a series of circular scales. Reading from the outer inwards, these are a scale for the time of sunrise marked 'OR<TUS> SO<LI>'; a scale for the length of the day marked 'QV<ANTITAS> DI<EI>'; a zodiac scale marked 'SI<GNI> ZO<DIACI>'; a scale of degrees marked in six sectors each of six divisions of 12? each, numbered 0 to 48 to 0; a scale disposed symmetrically around the 0? Aries point, '0 0 1 2 3 4 4 5 6 7 8 8 9 10 11 12 II 10 9 8 8 7 6 5 4 4 4 3 2 1 0' and sharing divisions with the sectored degree scale; an hour scale reading to 30 minutes (1 to 12, 1 to 12); within this is a central volvelle with an hour scale (1 to 12, 1 to 12) on its circumference which has an aperture cut in it to allow the age of the Moon to be read from a scale below. The slot is cut diametrically opposite to a circular opening in the volvelle through which the phase of the moon may be seen. The centre of the volvelle is occupied by an aspectarium. 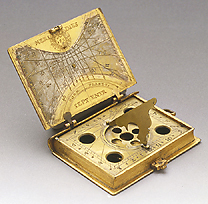 The inner cover has the area of the hour diagram silvered and carries a pin gnomon dial for planetary hours (6 to 12 to 6) crossed by a series of parallel vertical lines (1 to 11) for what appears to be a polar dial for Babylonian hours. Above the hour diagram is a sun symbol containing an omega and the initials 'I H S' (Jesus). The body of the volume contains an horizontal dial for approximately 47? (4 to 12 to 8 reading to 15 minutes of which the cutaway dial plate is set above a compass (now missing). The back cover on the 'book' carries tables showing the planet governing each hour of the day throughout a week. The spine is decorated with schematic tulips.